Made in England, United Kingdom, Europe, 1917. Single row rotary with poppet valves. Bore/stroke 4.72 x 5.91 in. Vol. 722.75 cu.in. (120 x150mm.). Compression ratio 4.3:1. Direct RH tractor/LH pusher drive. Bloctube carburettor, one magneto normally fitted. Diameter 36 in. 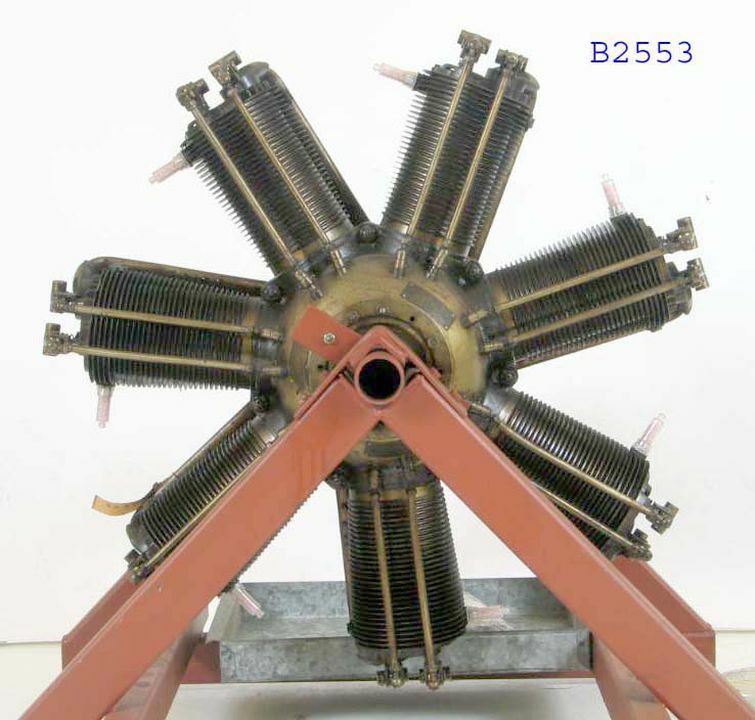 The Clerget-Blin 7Z rotary aero engine comprises seven finned cylinders radially disposed around the crankcase to which the propeller was attached. The crankshaft is hollow and fixed to the body of the aircraft while the cylinder assemblage rotated together with the propeller. The pipes at the rear of the engine transferred the air/fuel mixture from a chamber at the rear of the crankcase to each of the cylinders. The intake and exhaust valves were operated by separate push rods driven from two cams in the crankcase. A single bloc tube carburettor, with a simple fuel jet, attached at the rear of the crankcase, supplied fuel to the air intake. Since the crankcase volume did not vary as the engine rotated there was no pumping action to force a fresh mixture into the cylinders. Instead, the cylinder fills due to the suction generated inside it as the piston travelled down after the exhaust stroke. Because the only forces moving fuel/air mixture through the engine were centrifugal in the transfer passages and the suction generated in the cylinders, rotary engines used a pressurised fuel system to spray petrol into the carburettor. The cams operated the inlet and exhaust valves were set so that the inlet valve opened 4 degrees before top dead centre (TDC) and closed 56 degrees after bottom dead centre (BDC) while the exhaust valve opened 68 degrees before BDC and closed 4 degrees after TDC. Ignition commenced 22 degrees before TDC. Since it is impossible to fit an exhaust system to a spinning engine, the exhaust valve on each cylinder opened directly into free air inside the cowling. Even so, they were relatively quiet in operation as there was little pressure in the cylinder by the time the exhaust valve opened. As in most radial engines one of the connecting rods, designated the ?master rod', connects with the crankshaft in a conventional manner. The remaining connecting rods are pivotally connected to the big end of the master rod. This configuration means that the pistons do not follow the exact dynamics of the master piston. The engine operated on the four-stroke cycle where air was drawn first through the carburettor then through the hollow crankshaft to an annular chamber behind the crankcase and finally to the engine cylinders. An inherent problem in rotary engines was that this tortuous passage of the air/fuel mixture limits the power which could be developed. A single magneto, connected to a spark plug mounted on the side of each cylinder, initiated ignition which occurred in alternate cylinders during each revolution of the engine. The engine was started manually through the propeller. The engine normally ran at full speed which could only be varied by cutting the ignition via a 'blip' switch on the control column. Lubrication was a total loss system. Castor oil was injected into the carburettor by an engine-driven pump, with the unburnt residue forming part of the exhaust. The fuel/oil/air mixture flowed through the crankshaft into the crank case, where it lubricated the bearings before being transferred into the cylinders. This aero engine was made in England by Gordon Watney and Co Ltd of Weybridge, Surrey, in 1918. It is one 300 delivered from an order of 553 made between August 1914 and December 1918. The engine was designed in 1911 by Pierre Clerget who was born on 29 June 1875 in Dijon, France. In 1912 he developed a seven cylinder rotary radial engine, the 7Y, which developed 60 hp. On 18 August 1913 Clerget joined forces with the industrialist, Eugene Blin, to establish the firm Societe Clerget-Blin et Cie at Levallois-Perret. The first of a series of 80 to 150 hp Clerget engines were designed in 1913. They were subsequently built in large numbers in Britain during World War I. British manufacturers of Clerget engines included Gordon, Watney and Co Ltd of Weybridge, Surrey, (553 ordered, 300 delivered) of which this engine is an example; Gwynnes Ltd of Hammersmith (100 ordered, 47 delivered); and Ruston Proctor and Co Ltd, Lincoln, Lincolnshire. British engineers such as W.O. Bentley introduced aluminium pistons and other heat transfer means to overcome excessive heating of the Clerget engine. The engine is one of a group acquired by Professor Sir Henry Barraclough at the end of World War 1 for educational use by the University of Sydney, the group is one of the world's best collections of early 20th century aero engines. It was loaned to the Museum by the University of Sydney's Department of Mechanical Engineering in December 1943 and donated in August 1983.